Learn how to make Mini Cheesecakes with lots of step-by-step photos, detailed instructions, and a video. Only 10 minutes of hands-on preparation time and 8 ingredients required. Making Mini Cheesecakes is the easiest way to make cheesecake, and you don’t need to worry about that your cheesecakes crack or do not set. The baking time is much shorter too and they are great to freeze. If you have a tooth for delicious cheesecake but don’t want to make a regular size 9″ (23cm) cake then making this small batch Mini Cheesecake recipe is the best option for you. Do you need a Mini Cheesecake Pan? No. 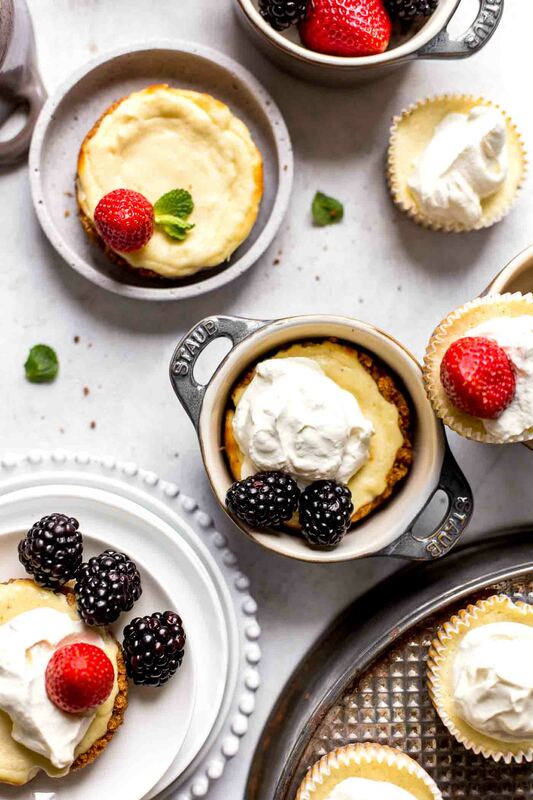 You can bake the Mini Cheesecakes in 6oz ramekins or a muffin pan. I show you both ways how to bake mini cheesecakes in ramekins and a muffin pan below. 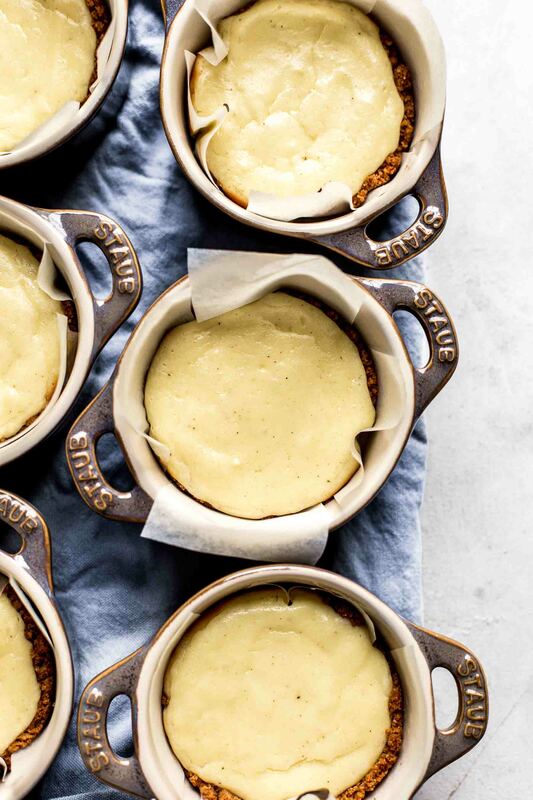 The recipe is enough for six 6oz ramekin-sized cheesecakes or 12 muffin-sized cheesecakes. 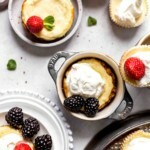 How to make Mini Cheesecakes in a cupcake pan or ramekins? 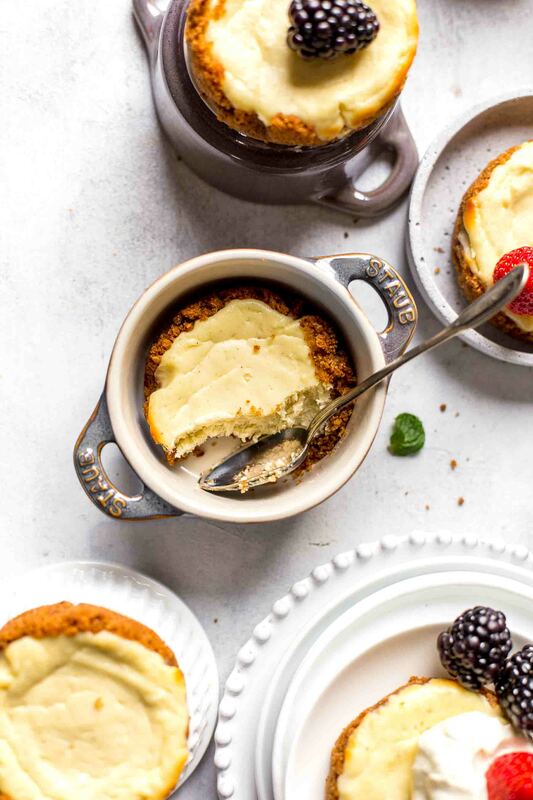 Because it’s an original New York Cheesecake recipe, adapted to a small batch version, it’s clear that these mini cheesecakes come with a graham cracker crust. The crust is easy to make and requires just 3 ingredients. 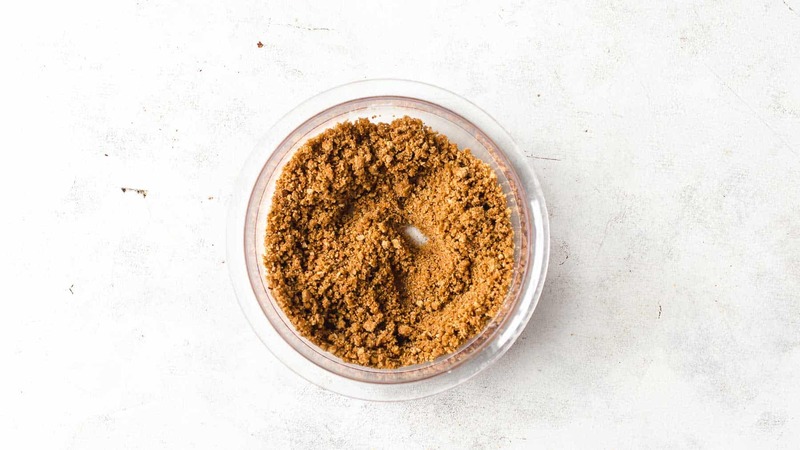 Crushed graham crackers, melted butter, and sugar. 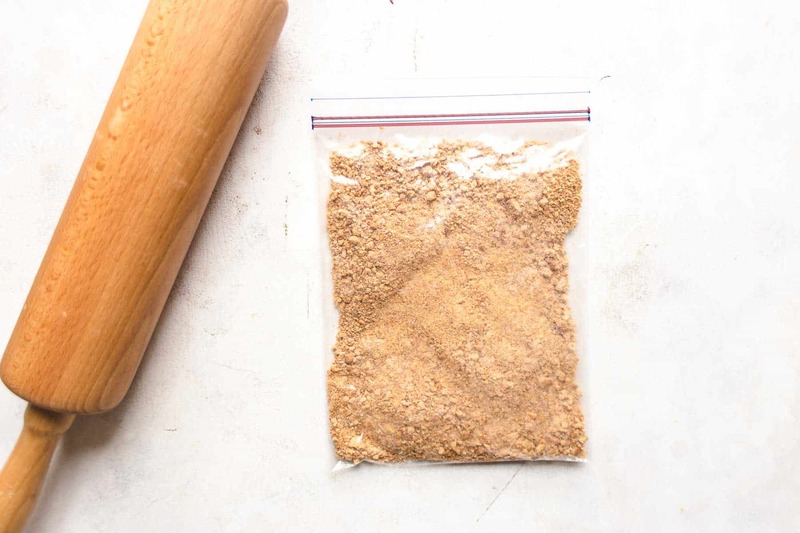 You can crush the graham crackers in a zip-top bag with a rolling pin or in a food processor. Combine all ingredients until evenly moist. Set aside. 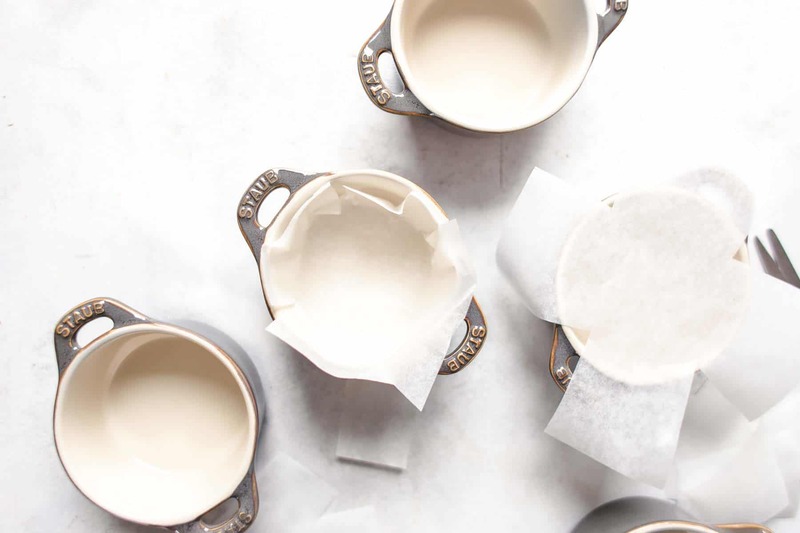 If you make this recipe in ramekins, then layer them with parchment paper. Cut out 6-inch large squares out of parchment paper. Lay one square on top of a ramekin and cut out the corners that it looks like a big plus sign. The inner edges of the plus sign should be the same size as the diameter of the ramekin bottom. Then push the paper into the bottom of the ramekin. Repeat until all ramekins are layered. See photo below. This trick makes it easier to line the ramekins and makes sure that you don’t have too much paper overlapping on the sides. Then fill the graham cracker crust evenly into the ramekins. I always start with adding 1 tbsp of graham cracker crust to each ramekin one after another until I run out of the crust. You could also weigh the crust and divide it by 6 for the most accurate result. But working with 1 tbsp after another is fine. Then press the crust into the bottom of the ramekins with the back of a flat-bottomed shot glass that the crust sticks together. If you don’t have a shot glass, then use your fingers or the back of a spoon to do that. 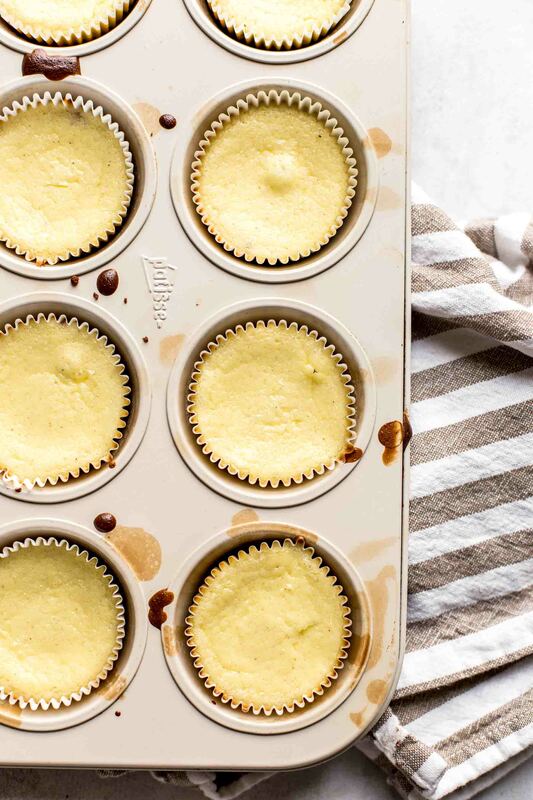 If you bake Mini Cheesecake Cupcakes, then line a cupcake pan with 12 cupcake liners. Evenly fill the crust into the cupcake liners and press the crumbs into the bottom of the liners. The easiest way to do that is with the back of a flat-bottomed shot glass, but you can alternatively do that with your fingers or the back of a spoon. 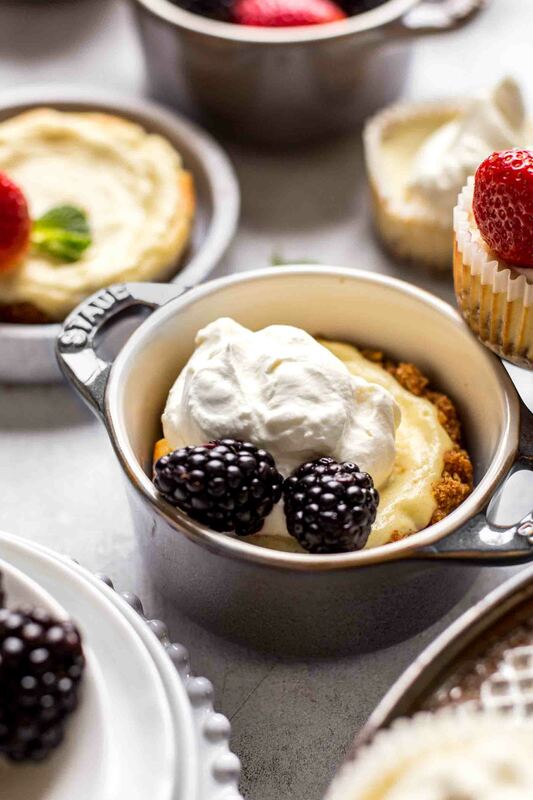 No matter if you do 6 ramekin-sized Mini Cheesecakes or 12 Mini Cheesecake Cupcakes, prebake the crust for 5 minutes. In the meantime, prepare the filling. You need for the filling cream cheese, sugar, flour, egg, vanilla, and heavy cream. The filling is made without lemon and sour cream. Both add sourness to the cheesecake. So, if you want to have your cheesecake sourer, replace the heavy cream 1:1 with sour cream and add 1 tsp of freshly squeezed lemon juice if preferred. Mix cream cheese until creamy. I recommend using room temperature cream cheese. First, it’s easier and faster to mix. Second, the result is evener. When using cold cream cheese, you need to mix longer and probably overmix it. After the cream cheese is creamy, add flour, and sugar and mix to combine. Then add egg and vanilla and stir to combine. In the end, add heavy cream and mix to combine If you replace the heavy cream with sour cream and lemon juice, then add one after another and mix in-between that it combines. The consistency of the filling is creamy but towards liquid. Spoon the filling evenly into the ramekins/liners with an ice cream scoop or tablespoon. 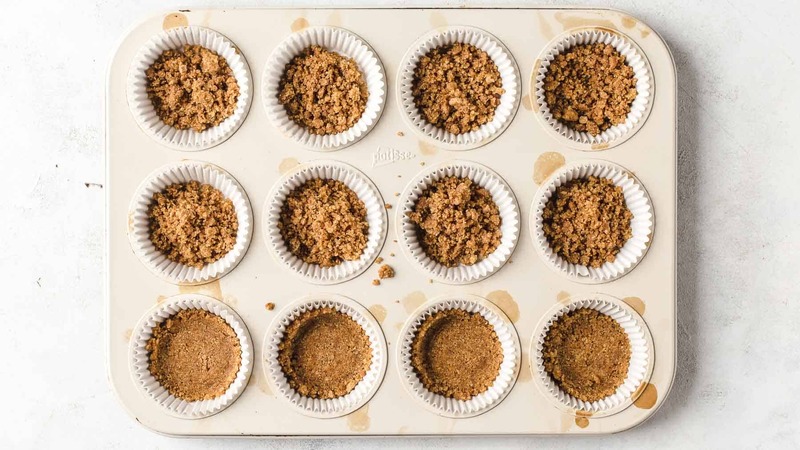 Weigh the filling and divide by 6 for the ramekins or by 12 for the cupcake liners. Instead of weighing you can add 1 tbsp of filling to each ramekin/liner after another until you run out of filling. The baking time is 20-23 minutes for the ramekin-sized Mini Cheesecakes and 13-15 minutes for the Mini Cheesecake Cupcakes. How to tell when Mini Cheesecakes are done? 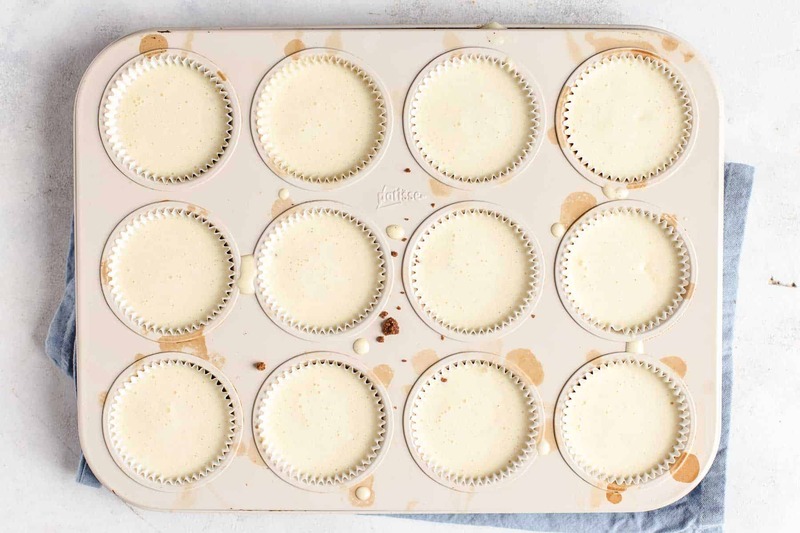 To tell when your Mini Cheesecakes are done, gently shake the ramekin or muffin pan. The edges should be set with a slight jiggle in the center. Do not check with a toothpick because this is not significant. The cheesecake firms up when it cools. When you overbake them, they get more firm and less creamy. Yes, Mini Cheesecakes freeze very well. Let the cheesecakes cool down to room temperature first and then chill them for about 2 hours in the fridge. Then wrap each mini cheesecake in plastic wrap tightly. Take care that you seal them completely. Place them in a freezer bag and remove as much air as possible. You can freeze them up to 1 month. Thaw in the fridge overnight. Therefore remove the foil and place the cheesecakes in an airtight container. Eat within 2 days. I love to top mine with whipped cream and lots of fresh berries. But there are many toppings to choose from like a strawberry sauce, caramel, fudge sauce, or eat it without any topping. You will love them either way. If you make this Mini Cheesecakes recipe leave a comment, rate it and tag a photo #alsothecrumbsplease on Instagram! Would love to see your snap! For more baking recipes click here to see all recipes. Preheat oven to 350°F / 175°C. Line six 6oz sized ramekins with parchment paper or a muffin pan with 12 cupcake liners. Set aside. Crust: In a large bowl stir together all ingredients until evenly moist. 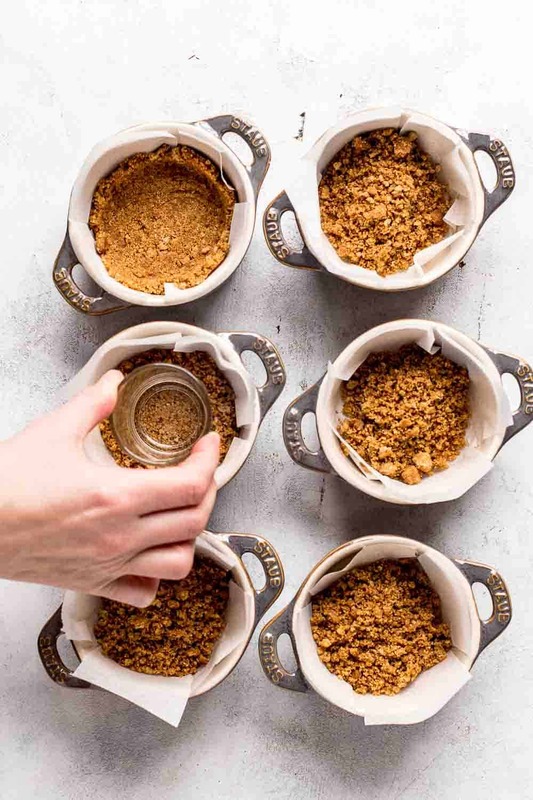 Transfer crust to the prepared ramekins or muffin liners and press crumbs with the back of a flat-bottomed shot glass or the back of a spoon into the bottom and a bit up the sides. Prebake crust in both cases (ramekins or muffin liners) for 5 minutes. 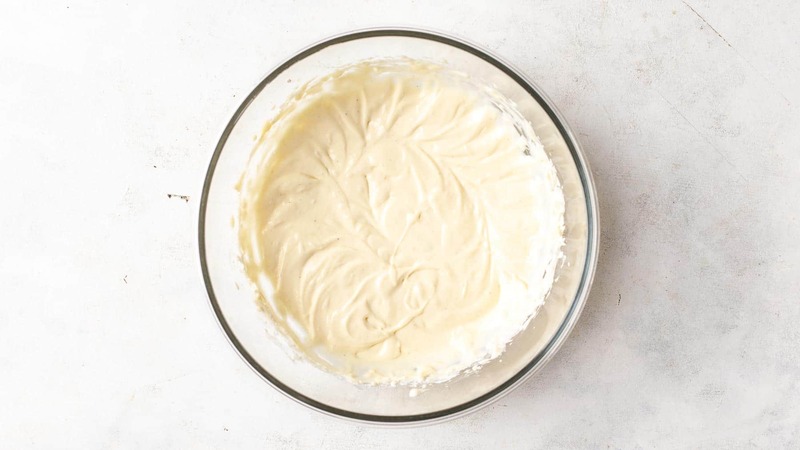 Filling: In a large mixing bowl, using a handheld or stand mixer fitted with a whisk or paddle attachment, beat the cream cheese on medium speed until creamy about 1-2 minutes. Add sugar and flour and mix until combined and no lumps remain. Stir in egg and vanilla until combined. Scrape down the bowl and add heavy cream. Mix until smooth and combined. Don't overmix at any step. Spoon filling evenly into the prebaked crust. 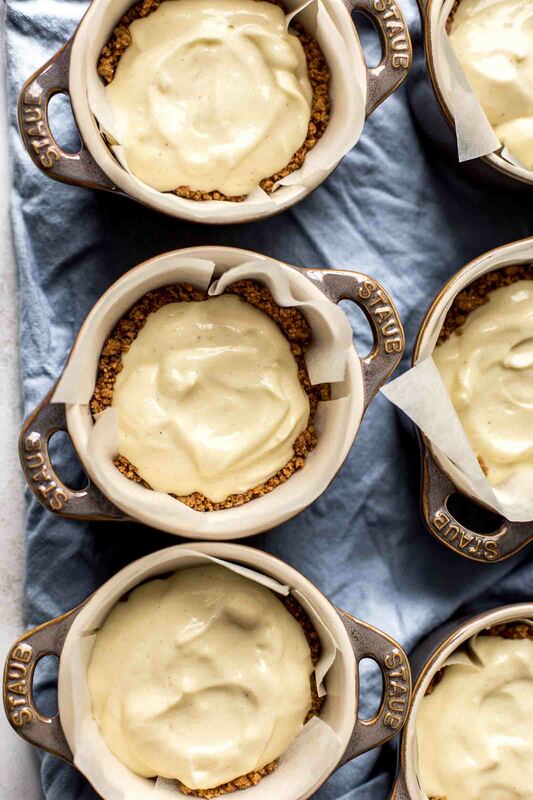 Bake ramekin-sized mini cheesecakes for 20-23 minutes. Bake mini cheesecake cupcakes for 13-15 minutes. The edges should be set and the center slightly jiggly. The centers firm up while cooling. Let cool to room temperature, then chill for 2 hours in the fridge. They will stay fresh in an airtight container at room temperature up to 3 days. Look through the step-by-step photos. Read blog post above for additional information on how to freeze mini cheesecakes, substitution of heavy cream with sour cream, how to layer the ramekin with parchment paper easily, etc. Watch 44 seconds recipe video. I tried Greek yogurt as a replacement and it was delicious. You can replace the heavy cream with Greek yogurt 1:1. I don’t have any experience with regular or fruit yogurt. Thank you so much, I’m happy that you like my recipes.